The USS Arizona Memorial, at Pearl Harbor in Honolulu, Hawaii, marks the resting place of 1,102 of the 1,177 sailors and Marines killed on USS Arizona during the Japanese surprise attack on Pearl Harbor on December 7, 1941 and commemorates the events of that day. 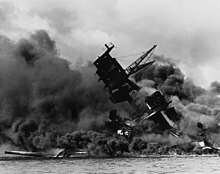 The attack on Pearl Harbor and the island of Oahu led to the United States' direct involvement in World War II. The USS Arizona Memorial is one of several sites in Hawaii that are part of the Pearl Harbor National Memorial. 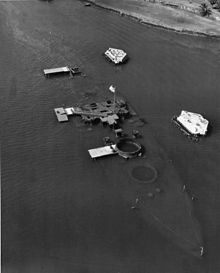 During and following the end of World War II, Arizona's wrecked superstructure was removed and efforts began to erect a memorial at the remaining submerged hull. Robert Ripley, of Ripley's Believe It or Not! fame, visited Pearl Harbor in 1942. Six years later, in 1948, he did a radio broadcast from Pearl Harbor in which he stated "I am sure that all my listeners will join with me in tribute to the heroes of Pearl Harbor." Following that broadcast, with the help of his longtime friend Doug Storer, he got in contact with the Department of the Navy. 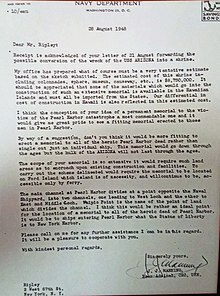 He wrote letters to Rear Admiral J.J. Manning of the Bureau of Yards and Docks regarding his desire for a permanent memorial. While Ripley's original idea for a memorial was disregarded due to the cost, the Navy continued with the idea of creating a memorial. The Pacific War Memorial Commission was created in 1949 to build a permanent memorial in Hawaii. Admiral Arthur W. Radford, commander of the Pacific Fleet, attached a flag pole to the main mast of Arizona in 1950, and began a tradition of hoisting and lowering the flag. In that same year a temporary memorial was built above the remaining portion of the deckhouse. Radford requested funds for a national memorial in 1951 and 1952, but was denied because of budget constraints during the Korean War. The Navy placed the first permanent memorial, a 10-foot (3 m)-tall basalt stone and plaque, over the mid-ship deckhouse on December 7, 1955. President Dwight D. Eisenhower approved the creation of a National Memorial in 1958. Enabling legislation required the memorial, budgeted at US$500,000, be privately financed; however, $200,000 of the memorial cost was government subsidized. "To the Memory of the Gallant Men Here Entombed and their shipmates who gave their lives in action on December 7, 1941, on the U.S.S. Arizona"
The national memorial has three main parts: entry, assembly room, and shrine. The central assembly room features seven large open windows on either wall and ceiling, to commemorate the date of the attack. Rumor says the 21 windows symbolically represents a 21-gun salute or 21 Marines standing at eternal parade rest over the tomb of the fallen, but guides at the site will confirm this was not the architect's intention. The memorial also has an opening in the floor overlooking the sunken decks. It is from this opening that visitors can pay their respects by tossing flowers in honor of the fallen sailors. In the past, leis were tossed in the water, but because string from leis poses a hazard to sea life, leis now are placed on guardrails in front of the names of the fallen. The USS Arizona Memorial was formally dedicated on May 30, 1962 ( Memorial Day) by Texas Congressman and Chairman of Veteran Affairs Olin E. Teague and Governor John A. Burns. It was listed on the National Register of Historic Places on October 15, 1966. While the wreck of USS Arizona was declared a National Historic Landmark in 1989, the memorial does not share this status. Rather, it is listed separately from the wreck on the National Register of Historic Places. The joint administration of the memorial by the United States Navy and the National Park Service was established on September 9, 1980. The "tears of the Arizona". Oil slick visible on water's surface above the sunken battleship. Oil leaking from the sunken battleship can still be seen rising from the wreckage to the water's surface. This oil is sometimes referred to as "the tears of the Arizona"   or "black tears." In a National Geographic feature published in 2001, concerns were expressed that the continued deterioration of the Arizona's bulkheads and oil tanks from saltwater corrosion could pose a significant environmental threat from a rupture, resulting in a significant release of oil. The National Park Service states it has an ongoing program that closely monitors the submerged vessel's condition. The USS Missouri and USS Arizona memorials. Upon the deck of the battleship USS Missouri in Tokyo Bay, the Japanese surrendered to United States General Douglas MacArthur and Admiral Chester W. Nimitz, ending World War II. In 1999, Missouri was moved to Pearl Harbor from the United States west coast and docked behind, and in line, with USS Arizona, placing it perpendicular to the USS Arizona Memorial. The pairing of the two ships became an evocative symbol of the beginning and end of the United States' participation in the war. The visitor center operated by the National Park Service is free to the public and has a museum with exhibits about the Pearl Harbor attack, such as the ship's bell from Arizona. Access to the USS Arizona Memorial is by U.S. Navy boat, for which a numbered ticket, obtained at the visitor center and valid for a designated departure time, is required. More than one million people visit the memorial each year. Because of the large number of visitors and the limited number of boat departures, the 4,500 tickets available each day are often fully allocated by mid-morning. Before boarding the boat for the short trip to the Memorial, visitors view a 23-minute documentary film depicting the attack on Pearl Harbor. Touring of the Memorial is self-guided. The National Park Service Web site provides visitor information, including hours of operation and ticketing advisories. A one-hour audio tour of the Memorial and Center exhibits, narrated by actress Jamie Lee Curtis, whose father, Tony Curtis was a World War II and Navy veteran, is available for rent at the visitor center. On the center's grounds along the shoreline are more exhibits and a "Remembrance Circle". Nearby is USS Bowfin, a World War II diesel submarine, which may be toured with separate, paid admission. The battleship USS Missouri and the Pacific Aviation Museum Pearl Harbor may also be visited, but require a bus ride to Ford Island. Every United States Navy, Coast Guard, and Merchant Marine vessel entering Pearl Harbor participates in the tradition of " manning the rails." Personnel serving on these ships stand at attention at the ship's guard rails and salute the USS Arizona Memorial in solemn fashion as their ship slowly glides into port. USPACOM Commander Admiral Harry Harris, U.S. President Barack Obama, Japanese Prime Minister Shinzō Abe, and a U.S. Navy sailor render honors at the USS Arizona Memorial, 27 December 2016. ^ a b "Remembering Pearl Harbor: The USS Arizona Memorial". U.S. National Park Service. Archived from the original on March 15, 2008. Retrieved May 9, 2008. ^ "Arizona, USS (battleship) (shipwreck)". National Historic Landmark summary listing. National Park Service. Archived from the original on May 13, 2008. Retrieved June 21, 2008. ^ Arizona Memorial Museum Association. "Creating the Memorial". AMMA website. Archived from the original on July 24, 2009. Retrieved October 8, 2009. ^ "Samuel Glenn Fuqua". Recipients, World War II (A-F). Medal of Honor. United States Army Center of Military History. July 16, 2007. ^ "How Elvis Helped Save the USS Arizona Memorial". USNI News. author=US Naval Institute Staff. December 7, 2016. ^ a b Bergman, Teresa (2013). Exhibiting Patriotism: Creating and Contesting Interpretations of American Historic Sites. Left Coast Press. p. 39. ISBN 9781598745979. ^ a b Bergman, p. 36. ^ Treena Shapiro (May 27, 2002). "Arizona Memorial seen as a dedication to peace". Honolulu Star-Bulletin. ^ "USS Arizona Memorial - History & Culture". National Park Service. September 18, 2006. ^ "USS Arizona Interments". USS Arizona Preservation Project 2004. December 18, 2007. Archived from the original on January 23, 2012. Retrieved December 5, 2011. ^ Horst Bendzulla. "The Tears of the Arizona". Artist's website. Archived from the original on May 11, 2009. Retrieved October 8, 2009. ^ Christine Hansen (September–October 2007). "Little Big Store". Hana Hou! Vol. 10, No. 4. Retrieved October 8, 2009. ^ Tritten, Larry (December 7, 2003). "`Black Tears' Still Shed For U.S.S. Arizona". South Florida Sun-Sentinel. Retrieved November 28, 2011. ^ "Oil and Honor at Pearl Harbor". National Geographic. June 2001. Retrieved January 2, 2008. ^ Bomar, Mary A. (August 2007). "Summary of Park Centennial Strategies" (PDF). National Park Service. Retrieved February 15, 2008. ^ "Pearl Harbor Oral Histories, Part 1" (HTML). C-SPAN. June 1, 2009. ^ Gregg K. Kakesako (October 15, 1997). "Will 'Mighty Mo' be too much?". Honolulu Star-Bulletin. ^ "Plan Your Visit (USS Arizona Memorial)". National Park Service. Retrieved April 4, 2008. 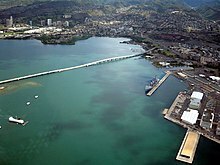 ^ "The USS Arizona Memorial at Pearl Harbor will stay closed through fall. Still, there's plenty to do at the World War II site". Los Angeles Times. July 31, 2018. Retrieved August 18, 2018. ^ "Frequently Asked Questions - World War II Valor in the Pacific". National Park Service. Retrieved March 31, 2019. ^ "USS Arizona Interments". World War II Valor in the Pacific National Monument. National Park Service. 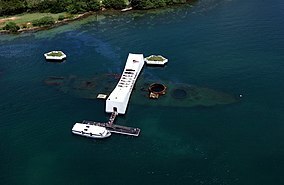 ^ "USS Arizona Memorial (National Park Service website)". Retrieved May 9, 2010. ^ Adamski, Mary (22 Oct 2003). "Isles a stopover and vacation spot for presidents". Honolulu Star-Advertiser. Retrieved 12 December 2017. ^ "Obama, Abe remember Pearl Harbor dead in historic Arizona Memorial visit". Honolulu Star-Advertiser. 27 December 2016. Retrieved 1 February 2017. 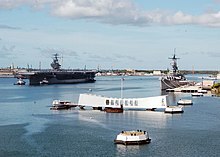 Wikimedia Commons has media related to USS Arizona Memorial. Historic American Engineering Record (HAER) No. HI-13, " USS Arizona, Submerged off Ford Island, Pearl Harbor, Honolulu, Honolulu County, HI"